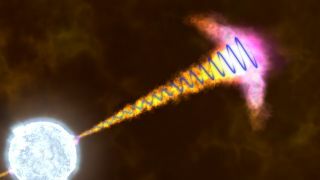 An artist's illustration of how theoretical models link the presence of strong, stable polarized light in a gamma-ray burst's jet with a large-scale magnetic field (a blue spiral) originating from the newly formed black hole. Scientists have captured their best view yet of how extreme magnetic fields shape superfast jets from the most powerful explosions in the universe. The new research tracked polarized light from cosmic explosions, known as gamma-ray bursts, and offered an unprecedented glimpse into how intense magnetic fields shape the evolution of the outbursts. Gamma-ray bursts are believed to form at the end of a massive star's life, just as the body of the star collapses in on itself, creating a black hole. As this happens, the matter surrounding the black hole may release two jets of gamma-rays and highly energetic particles, in opposite directions away from the black hole. A single gamma-ray burst may radiate more energy in a few minutes than the star radiated in its entire lifetime. Scientists still don't understand how the particles surrounding a black hole can generate the intense bursts of light and particles seen in gamma-ray bursts. One theory suggests that an organized magnetic field will accelerate particles on an invisible track around the black hole, causing them to radiate light (what's known as synchrotron radiation). As the black hole rapidly contracts, so do the particles and the magnetic field, causing the particles to accelerate even faster. The theory suggests that it is this rapid bump in acceleration, combined with energy stored in the particles themselves, that creates two massive jets of gamma-rays and particles. This illustration shows how measurements of polarized light in the afterglow of the gamma-ray burst GRB 120308A by the Liverpool Telescope and its RINGO2 instrument indicate the presence of a large-scale stable magnetic field linked with a young black hole. If the energy in a gamma-ray burst was at least partly due to synchrotron radiation, then scientists could expect to see an imprint of that magnetic field in the light produced by this violent event. Mundell and her colleagues designed an instrument named RINGO2 to measure the polarization of optical light that is produced as a byproduct of a gamma-ray burst. RINGO2 observed gamma-ray bursts for two years on the Liverpool optical telescope. On March 8, 2012, NASA's Swift satellite — which tracks gamma-ray bursts — alerted the Liverpool telescope to a cosmic explosion dubbed GRB 120308A. The subsequent study, which was detailed in the Dec. 5 edition of the journal Nature, found that optical light emitted early on by GRB 120308A was 28 percent polarized, and decreased to 10 percent polarization over time. "If you take optical light and you scatter it from dust, as it comes through our Milky Way galaxy, you might observe a few percent polarization," Mundell said. "Really the only way to produce this high degree of polarization is to have large-scale ordered magnetic fields that are producing the synchrotron radiation with the electrons spiraling around the magnetic field." Mundell said the reduction in the polarization of the light over time demonstrates that the light is polarized upon its creation near the black hole, and loses its polarization as it travels through space. For this reason, RINGO2 must observe the optical light almost immediately after the start of the gamma-ray burst, in order to observe the polarity. More observations of polarized light in future gamma-ray bursts are needed to confirm the findings, the researchers said. RINGO2 operated on the Livermore telescope for two years and collected data on multiple gamma-ray bursts. "We're in the process of working on a sample paper about those other gamma-ray bursts," Mundell said. "Obviously, we want to look at more of them and really prove that this is a universal case and not just a special object. [GRB 120308A] wasn't special in any other way, and that's one good reason to suggest that it was typical."